Liz Baterina, with Econotech since 2008, working with black liquor. Recovery operations have important economic implications for Kraft pulp mills and Econotech has testing capabilities that may be invaluable to you. Below is an overview of the ways we can help you; for more details, consult the "services" menu above. We are experts in black liquor analysis. Most new customers come to Econotech after being referred by an experienced colleague or consultant. From testing active alkali, to boiling point rise, to carbonate/sulfate ratios through to viscosity, Econotech has been a trusted name for over 40 years. Feel free to review our black liquor analysis packages. Depending on prevailing market prices, many organic by-products may be worth extracting instead of burning. We regularly test terpenes in condensate, tall oil skimmed from black liquor and lignin from black liquor. You may be interested in looking at other compounds (sugars, organic acids, etc) or doing an experimental pulping trial on biomass (including prehydrolysis); talk to us about your needs. Econotech offers fuel value testing of black liquor and other materials such as hog fuel or wood pellets. Contact us for proximate / ultimate analysis including ashing, C,H,N,O analysis as well as metals analysis etc. We can handle every sample type including liquors, smelt, scales, and saltcake. We quantify sodium sulfide and sodium hydroxide as well as compounds like sodium carbonate and sodium sulfate that - depending on the sample type - can contribute to dead-load along with sodium chloride. We provide elemental analysis via spectrometry (both ICP-optical emission and atomic absorption), determination of anions by ion chromatography or wet chemistry techniques, and more. Be sure to contact Econotech when you are doing a mass balance on your system! There are additional ways that Econotech may be of service to you in optimizing your recovery processes. We provide testing of lime mud and reburned lime and we also offer a fast, operator-friendly reburned lime analyzer for on-site analysis of residual carbonate. 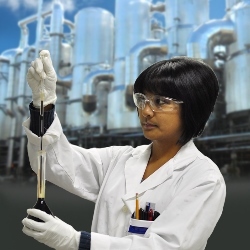 In terms of the environment, Econotech is recognized for testing chlorinated organics (AOX) in effluents, sediments, grease and oils etc (and in pulp or paper, of course). We also offer testing for resin & fatty acids, terpenes, nitrates, biological oxygen demand (BOD), chemical oxygen demand (COD) etc. However, our focus is on pulp & paper processes and products; we are not a full service "environmental lab". Email us with any questions you may have.